It’s your year-end appeal and you’ve worked hard to create the perfect mailing. You send out your mailing to all your constituents, but the materials only include the Organization address per your records. After a long journey through the post office, your mail finally reaches the desired organization, but it has no specific contact. It gets stuck at the front desk and ends up in the trash. All your hard work down the drain. How do we avoid this? Selecting the address fields from the Address Processing option is imperative. This determines if Organizations or Contacts should be mailed to. Include any desired fields in addition to the address information, such as Position and Organization Name. If you are using the Primary Salutation to address the recipient of your mail, you will want to include the Constituent Addressee/Salutation fields, as well as the contact Addressee/Salutation fields. This is because the Contact Add/Sal will only be populated if there is a contact. Therefore, you will need a separate field for the Individual Addressee/Salutation. If you want to avoid having two fields used for Addressee/Salutations, create a duplicate export used only for Organization records. 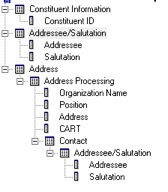 In the Organization export, only include the Contact Addressee/Salutation and in the Individual export, only include the Constituent Addressee/Salutation. 4. Which Address to Use? Right click on “Address Processing,” select Criteria, and click on the Org Address tab. 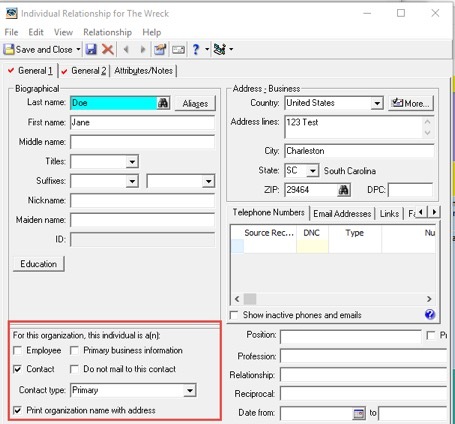 In “Step 1,” you can determine if the address for each contact should be the organization’s address or the contact’s address. In the same screen in “Step 2”, consider filtering the Contact Types to include specific Types, such as only Primary Contact by selecting the “Include Selected Contact Types Only” checkbox. Address processing will default to include just the first contact found. 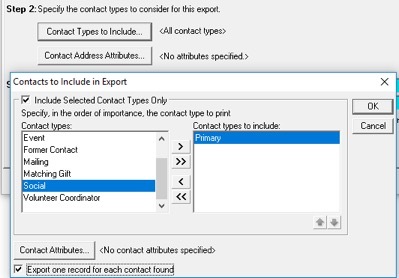 If you want to mail to all contacts associated with the Organization or multiple contacts with the same type, make sure to select the “Export one record for each contact found” checkbox. 6. What Happens if No Contact is Found? If the organization record doesn’t have any contacts, you can choose to mail to a specific Organization address or export the record with no address. If you would like to remove organizations that don’t have a valid address, select the “Remove Record” checkbox. By accurately tracking your Organization Contacts and selecting the appropriate export settings, you can successfully reach your Organizational Constituents and mail to the desired contact. What are you waiting for? Clean up your Organization Contacts and ensure your next appeal mailing doesn’t end up in the trash! 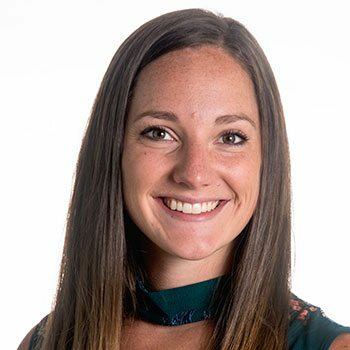 Kristen is a Consultant on the Professional Services team at Omatic Software where she conducts software implementations, delivers customizations, and provides short-term staffing support. Kristen specializes in implementing ImportOmatic and the ImportOmatic Connectors. She also completes database migrations and data hygiene projects. She has more than eight years of nonprofit experience and currently resides in Houston, TX. Kristen holds a BBA in Entrepreneurial Management and a BFA in Modern Dance from Texas Christian University.